Well, in some ways, yes, in others, no. The first thing to note is this is undeniably a kids film, and more than that, undeniably a cartoon movie. Some of the strip’s more biting commentary is washed away here (bar one morbid line in a post-credits scene), and you’ll see a lot of characters moving in ways that are impossible or being in one location one second and somewhere else doing something completely different the next. We don’t quite reach Scooby Doo levels of that one scene in a corridor with a bunch of doors, but it’s not far off. There’s also a bunch of slapstick throughout, with poor ol’ Charlie Brown often taking quite the beating in his attempts to fly a kite or catch a bus. A majority of the film is dedicated to his repeated build-ups and downfalls in many respects, as he tries to master dancing or write the perfect book report all to impress the new girl. Which leads us to the plot. Four panel strips about having a football yanked out from you or some kid playing the piano don’t translate all that well to a 80 minute movie, so here we have a story about a new girl, only ever called the “Little Red-Haired Girl”, who I learned is actually a Peanuts character and not somebody created for the film (I read like 4 books of a 50 year strip, that probably explains why). She exists only really to be the object of his affections though, doing and saying very little until the film’s closing moments. 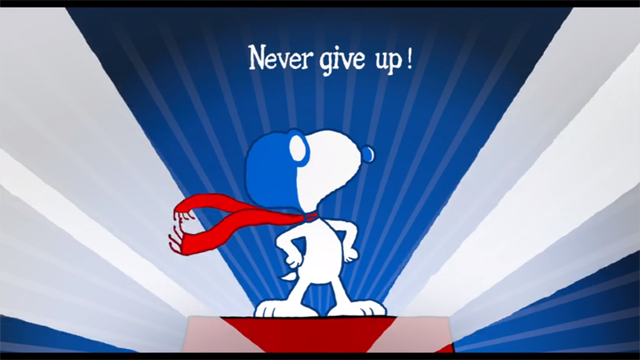 The B-story of the film has a similar vibe, as Snoopy, everyone’s favourite dog, tries his hand at writing a novel about his never-ending war with the Red Baron, and how he tries to win the affections of female dog pilot Fifi and save her from the villains. She ends up doing a bit more than Little Miss Red, somewhat holding her own and taking advantage of chaos to escape. The rest of the cast though get to do a lot more. Free of that four panel limit where most strips by default have to involve Charlie Brown (never Charlie, always Charlie Brown), suddenly everybody else can say and do a whole lot more. Snoopy and Woodhouse run riot across the town, Lucy gets to lament and laugh at the walking misfortune of the lead kid, Patty is all brawn little brain and drags her bestie Marcie, the polar opposite, into her various life conundrums. Even if you have little to no memory of the strip, you’ll leave knowing everyone, from Sally who’s quick to cash in on her brother’s fame, to the piano-obsessed Schroder. None of them may develop, per say, but they all get clearly defined. And for those who do remember, the amount of fanservice (the actual variety, not the anime kind) is insane. The kite tree, Pig Pen’s constant aura of dirt, the psych clinic, adults never being shown, even the trademark tumbles, it’s all here and lovingly recreated. 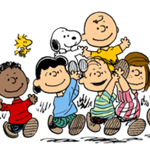 The cherry on the cake might just be the characters all imaging in the classic Peanuts strip style as well. As a gateway to the wonderful world of this strip, this is pretty dang great. Speaking of great, some of the comedy in this is top-notch. From one child treading in Charlie’s snow trail as he “followed in the footsteps of greatness” to an expert analysis of War and Peace concluding “Russia is very snowy and cold”, you can’t help but smile along throughout the movie. It does nothing that you won’t have seen elsewhere, but it’s all executed with such charm it’s impossible to hold that against it. Even the artstyle lends itself to that. 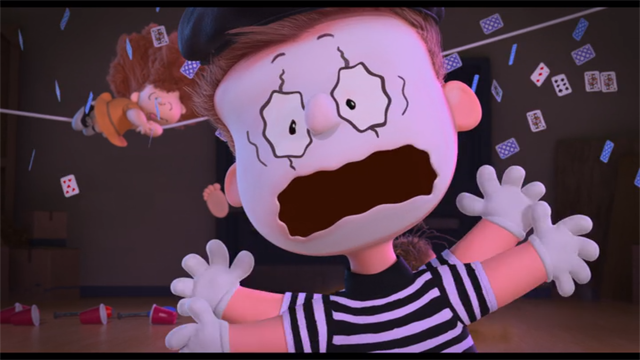 While the sort of felt fuzz to characters and making it all CG arguably makes the film blend in a bit with the competition, the scribbled on faces are something fresh, from Charlie’s scribbled on hair to the endless expression on Snoopy’s scribbly furrowed brow. Looking at my notes, while I started sceptical, I was a total fan of the style by the time the credits rolled. And that, in many ways, is my kind of summary of the film. I started off a critic, and while I’d be lying if I said the narrative ever picked up, or Snoopy’s dogfights with the Baron ever really added much (if anything, at times they interrupt and feel weird when the film jumps back to the main plot), or even that the end of the film is all that much of a resolution… I still had fun watching it. 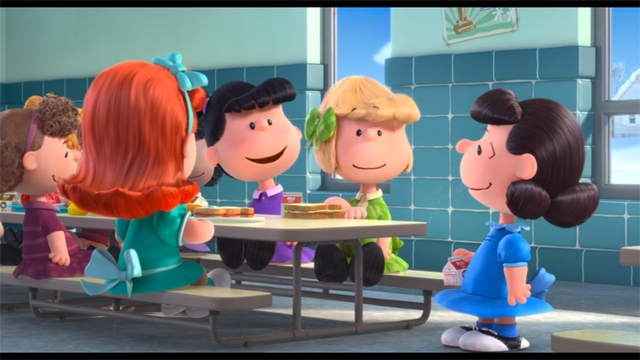 Be it nostalgia or charm, there’s a magic to the cast and world of Peanuts that means you can’t help but fall in love.